H oward Brunn, a sharp-as- a-tack nonagenarian, has worn many hats in his lifetime. Militar y pilot. Actor. Process server. Bailiff. Police officer. Retail store manager. Business- man. Politician. Community leader. Husband. Father. Poet. And as this magazine goes to press, he's con- sidering adding another to the list: mayoral candidate. Howard Brunn is one of a rare breed indeed, the Carmel native. Though born in San Francisco, his family came to Carmel-by-the-Sea in 1926 when he was 3 years old. "My dad owned a garage on the southeast corner of Ocean and San Carlos," Brunn recalls. Carrigg's of Carmel occupies that spot today. He attended Sunset School through the 8th grade and attended Monterey High until his junior year. Carmel High School opened after that and he graduated with the 1942 class, the school's second. World War II was in full swing then. "I wanted to be either a flyer or a fireman," he says. "I heard about a program to train pilots called Aviation Cadets and signed up." So much for dreams of firefighting. Based in Corsica, Brunn flew twin-engine B-25 "Mitchell" bombers on 70 European bombing raids. "I didn't want to talk about the war for many years…the last one of my colleagues passed away a few years ago. Now it's all histo- ry, and I feel able to explain my experiences." Returning from the war, Brunn studied acting in Los Angeles and performed in plays around the area. "Eventually I came to the real- ization that to devote my life to acting, I would have to move to New York," he says. After a series of jobs with the Los Angeles court system, he returned to the Peninsula, taking a position as a midnight-to-morning officer with the Monterey Police Department. "Monterey was a very sleepy place then," he says. "It was wonderful. Very little crime. I never even thought about taking my gun out of its holster." To supplement his income, Brunn took a day job clerking for Earl Glennan in his Carmel men's retail clothing shop. It was a move that would define the next few decades of his career. Finding a hidden talent for merchandising, the young man moved on to manage another shop, before opening his own, epony- mously named store at the Pine Inn. "I sold Talbott ties there," he recalls, "and that resulted in my meeting my best friend, Robert Talbott." 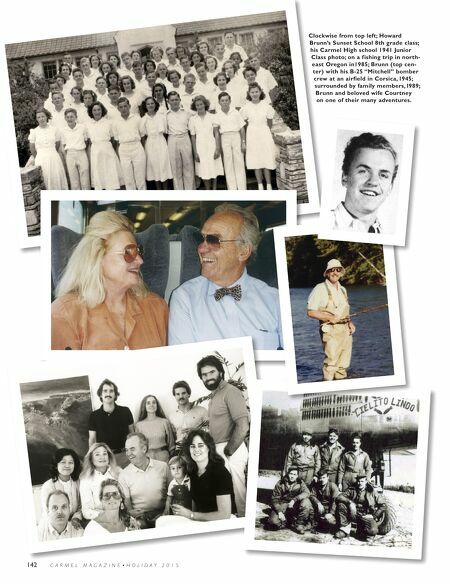 From that beginning, Brunn started several businesses, including build- ing a chain of five Mark Fenwick women's clothing stores and the Carmel Bay Company, founded with his friend Barney Scollan. Jimmy Lyons, founder of the Monterey Jazz Festival, was another close friend. "I love jazz and was at the first festival in 1958," Brunn says. 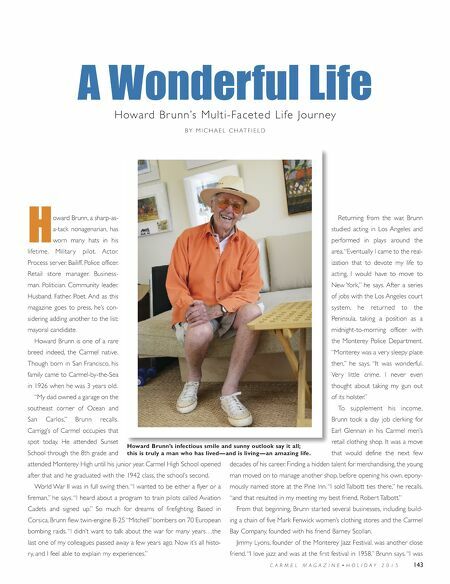 "I was A Wonderful Life Howard Br unn's Multi-Faceted Life Jour ney B Y M I C H A E L C H AT F I E L D a a t t V t C A R M E L M A G A Z I N E • H O L I D A Y 2 0 1 5 143 Howard Brunn's infectious smile and sunny outlook say it all; this is truly a man who has lived—and is living—an amazing life.